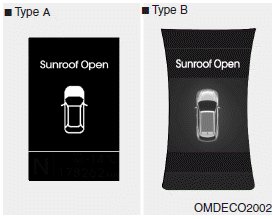 If the driver removes the ignition key (smart key: turns off the engine) and opens the driver-side door when the sunroof is not fully closed, the warning chime will sound for a few seconds and a message "Sunroof Open" will appear on the LCD display. Close the sunroof securely when leaving your vehicle. If you would like to carry items on the roof using a cross bar, do not operate the sunroof. When carrying cargo on the roof, do not load heavy items above the sunroof or glass roof. Do not allow children to operate the sunroof. Do not extend any luggage out side the sunroof while driving.